More than 150 lawmakers from Latin America and the United States have signed a letter addressed to Venezuelan President Nicolas Maduro. 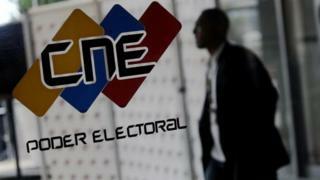 They urge him to allow international observers to monitor Venezuela's legislative polls on 6 December. Venezuela has invited monitors from regional body Unasur but has rejected those from the Organisation of American States (OAS). The lawmakers also called for the release of jailed opposition leaders. The letter to Mr Maduro was signed by 157 lawmakers from Brazil, Chile, Colombia, Costa Rica, Peru and the United States. It says that "as citizens go to the polls, the presence of qualified international observers would permit all Venezuelans to have the highest degree of confidence in the integrity of the process and the electoral results". It calls on Venezuela to allow monitors from the European Union and the OAS as well as Unasur to observe the election on 6 December. Some polls suggest it may be the first time in 16 years that the governing coalition could lose its majority in the National Assembly, Venezuela's legislative body. The lawmakers' letter was published just a day after OAS head Luis Almagro sent a similar request to Venezuelan officials. Mr Almagro, who is from Uruguay, urged the head of Venezuela's National Electoral Council, Tibisay Lucena, to guarantee free and fair elections. In his 18-page letter, Mr Almagro says that there "are reasons to believe that the conditions in which the people will vote on 6 December will not enjoy the level of transparency and electoral justice, that you, at the National Electoral Council, should guarantee". Mr Almagro expressed concern about the number of opposition politicians barred from standing in the election. He also cast doubts about the evidence used in the trial of opposition leader Leopoldo Lopez. Mr Lopez was sentenced to 13 years and nine months in prison for incitement to violence during mass anti-government protests. The prosecutor in the case, who has since left Venezuela, alleges that the trial was a sham to silence Mr Lopez. The leader of Venezuela's National Assembly, Diosdado Cabello, reacted to Mr Almagro's letter by slamming the OAS. He called the regional body "the most perverted, corrupt and discredited organisation in the world" and accused it of threatening the people of Venezuela. Venezuela has been critical of the OAS in the past, saying that it is dominated by the United States, with which Venezuela has rocky relations.